Rockland County, NY - A pair of fires in Harriman State Park has Rockland County officials advising residents to exercise caution because of poor air quality and smoky conditions. The first fire began at approximately 2:30 PM on Sunday afternoon in the Pine Meadow area of the park near the intersection of Route 202 and Wilder Road in the Town of Ramapo. Members of the New York State Parks Police battled the fire for several hours with flames visible for miles around. Governor Andrew Cuomo announced that the initial fire burned an area approximately 100 acres in size before it was completely contained. A second fire erupted in a remote portion of the park in the Town of Tuxedo in Orange County at approximately 11:45 PM Sunday night. 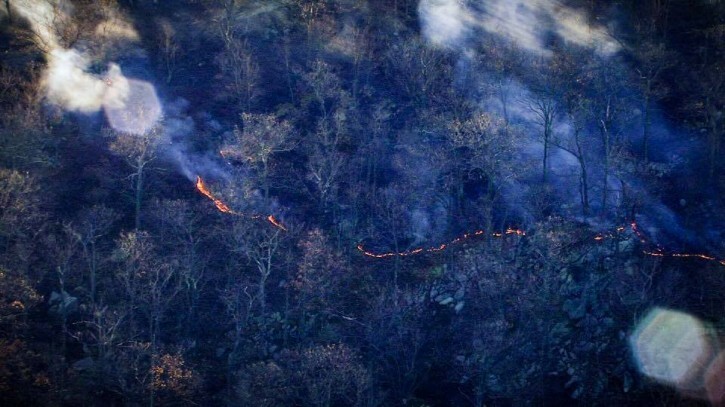 Now 90 percent contained, that fire burned an estimated 440 acres of woodlands. More than 40 members of multiple state agencies are on hand battling the flames, a process made more difficult because of the challenging hillside terrain. Rockland County Fire Coordinator Gordon Wren said that local fire crews have been on standby and that no private homes or property appeared to be in danger. Students at Bais Yaakov of Ramapo and Ateres Bais Yaakov, both located near the fire scene, were dismissed early today because of the smoky conditions. Residents in the Jewish neighborhoods of Forshay, Wesley Hills and Pomona had clear views of the flames last night. By morning, a significant portion of the Monsey community smelled heavily of smoke, with local fire crews receiving multiple calls regarding the burning smell in the area. A heavy haze could be seen hanging over portions of Harriman State Park, the second largest park system in the state. Conditions became more difficult today as the winds shifted, with Wren describing the situation this afternoon as “a mess,” but conditions improved later in the day. Dr. Patricia Schnabel Ruppert of the Rockland County Department of Health urged area residents to limit their exposure to smoke and dust, particularly those who are pregnant, have asthma or respiratory diseases. County residents near the fire scene are being advised to restrict outdoor physical activity, to keep windows and doors closed and to monitor air quality reports for further instructions. Don't think it will be a problem after today. Bigger health issues in Monsey are lack of immunizations and mental health care.